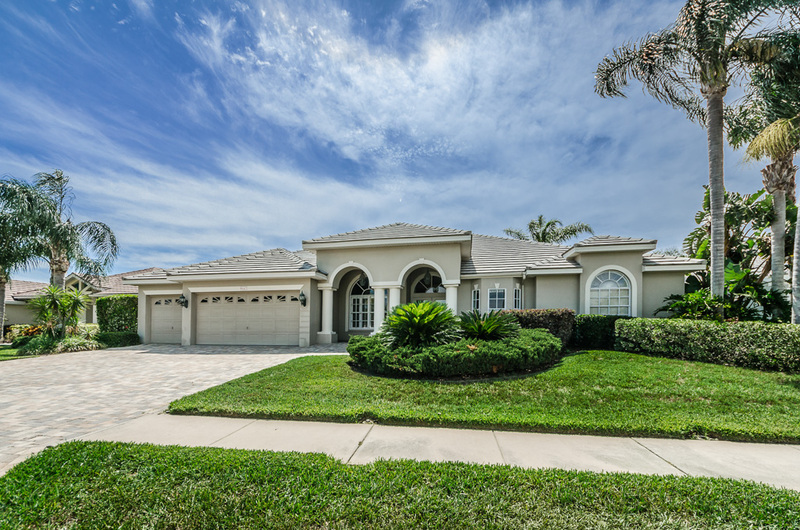 Stunning Executive Pool Home On Oversized Lot! The gated community, Inverrary of Fox Hollow, is home to some of Trinity’s most beautifully designed residences. This one, located on an oversized pie-shaped lot is no exception with its 4 Bedrooms plus office/den, 3 Full Baths, and 3 Car Garage. 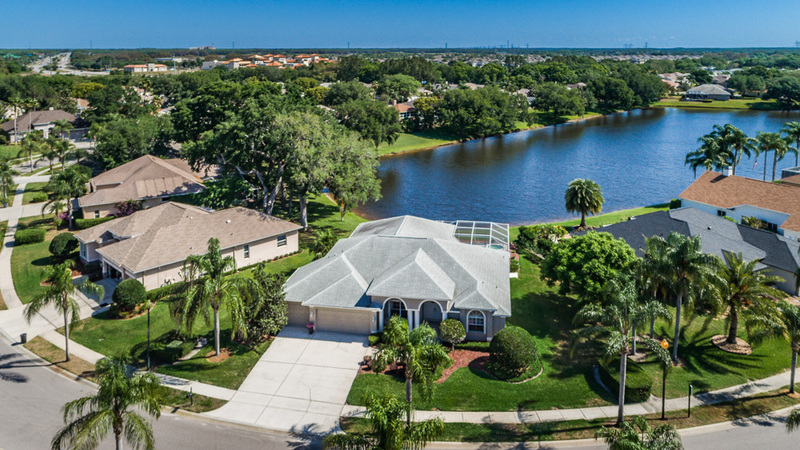 Besides all the glorious space, this is simply a classically stunning Florida home that is ideally situated at the end of a cul de sac. 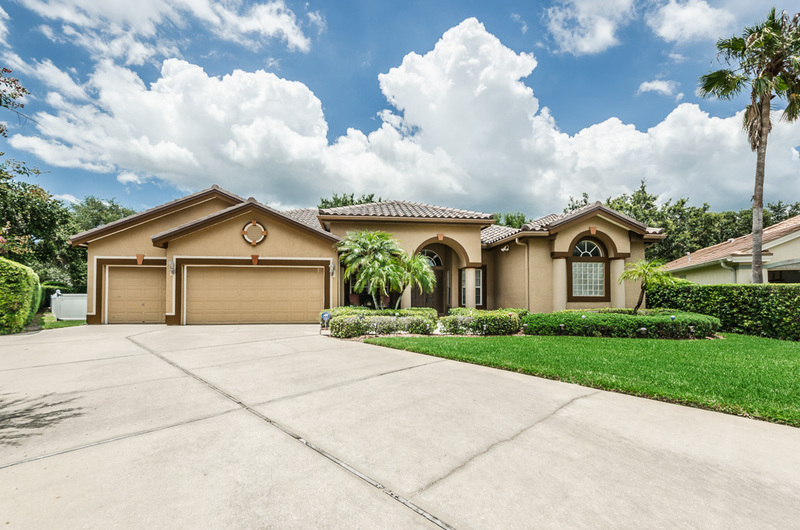 From the spectacular entranceway with barrel arch supported by grand pillars, to the NEW tile roof installed 2016, the exterior is impeccably landscaped with rear yard completely fenced. You’ll welcome guests through the grand foyer flanked by the formal living room & dining room plus a home office perfectly positioned for privacy. The heart of the home is the striking kitchen & airy family room with sliders to the sparkling pool & screened lanai. Both the kitchen and the family room combine to deliver the “wow” factor and access to the pool. The kitchen is expansive with its center island, lustrous granite counters, hardwood cabinets, sleek black appliances, and pantry. It is separated from the ideal family room by a breakfast bar. A split bedroom floor plan, NEWER HVAC, NEW hot water heater and NEWLY painted interior and exterior complete this very pretty picture. https://trinityeastlakerealestate.com/wp-content/uploads/2018/03/LC-WebLogo-340x156-300x138.png 0 0 loricrawford https://trinityeastlakerealestate.com/wp-content/uploads/2018/03/LC-WebLogo-340x156-300x138.png loricrawford2017-07-11 08:59:442017-07-11 08:59:44Stunning Executive Pool Home On Oversized Lot! The entrance to this custom-built, Samuelsen executive home is spectacular: multi-hued pavers, arched porticos atop stately columns, and a pendant lamp that shines on cut-glass double doors. Your guests will be welcomed into a beautifully appointed, formal dining room accented with a large picture window and sweeping views of the formal living room with sliders to the lanai. The sunlit family room is a retreat, stone tiles frame its fireplace. Triple sliders reveal the resort-style, alfresco entertainment center where you’ll relish the shaded dining area flanked by plenty of space for chaise lounges and an outdoor kitchen area featuring a Jenn Aire grill, sink and storage cabinetry; all overlooking the sparkling, screened-in pool. Rich, solid wood cabinetry, a granite-topped center island, breakfast bar, built-in desk, and adjacent casual dining nook, showcase thoughtful design in the kitchen. The master bedroom suite is resplendent featuring a soaking tub with vanities on opposite walls to maximize and balance the space. A private set of sliders leads to the lanai. Of the two spacious bedrooms, one at the rear of the home has been converted to a suite with its own full bath; ideal for guests, a teenager, or in-laws. The home office with a closet, boasts a windowed niche and built-in bookcases with storage; it can easily serve as a fourth bedroom. With a 3-car garage, A/C replaced in 2013, hot water heater replaced in 2015; this residence in the gated community of Inverrary within Fox Hollow is grand. Stunning Views of Fox Hollow’s 6th Fairway! A spacious, screened lanai overlooking a spectacular golf course defines luxury living in Florida’s famous Fox Hollow. 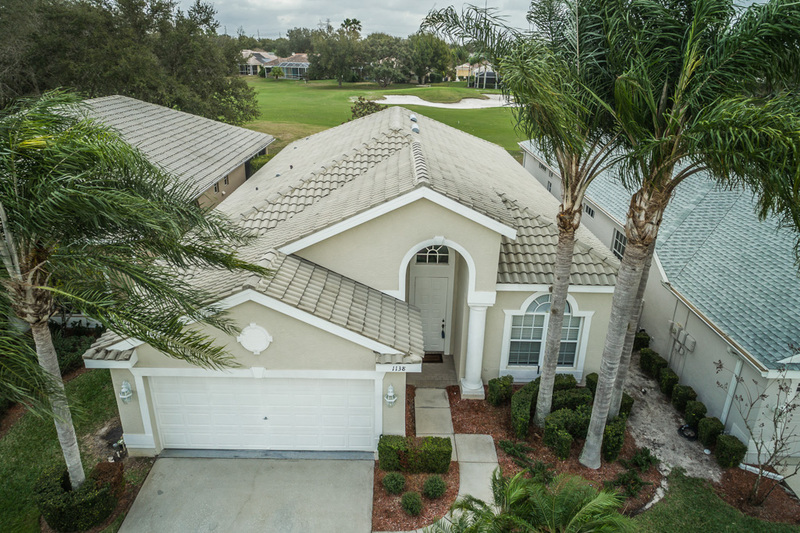 This 2 bedroom, 2 full bath, 2 car garage home with elegant, French-doored office is nestled on the 6th Fairway of the Fox Hollow Golf Club; widely considered a premier facility in the Tampa Bay area. With its 10-acre lake and clubhouse’s eclectic dining options, this location is a Trinity jewel. Sun dappled by leafy palm trees and surrounded by groomed hedges, this home’s access is kept exclusive by wrought iron gates that welcome you to the Peachtree community. Inside, you’ll find an impeccably maintained home with all the space and sunshine you’ll ever need. The foyer’s gleaming tile floor and soaring barrel ceiling introduces the office where furniture will define this multi-purpose room; as well as a gracious living room complete with tray ceilings and sliders to the lanai. Besides a laundry room, a light and bright open kitchen features a breakfast bar, and a counter-mounted, flat stove top, with built-in oven and microwave to add to the sleek look illuminated by recessed lighting and eyebrow windows. Framed on one end by a sunny dining nook, and the other by a formal dining room, this is the heart of the home. The master suite boasts everything you’ve come to expect including private access to the lanai, huge walk-in closet, soaking tub, and dual sinks separated by a door to the commode and tiled shower. With a community heated pool, HOA fees cover outside maintenance/lawn care. https://trinityeastlakerealestate.com/wp-content/uploads/2018/03/LC-WebLogo-340x156-300x138.png 0 0 loricrawford https://trinityeastlakerealestate.com/wp-content/uploads/2018/03/LC-WebLogo-340x156-300x138.png loricrawford2017-01-27 06:50:292017-01-27 06:50:29Stunning Views of Fox Hollow's 6th Fairway! 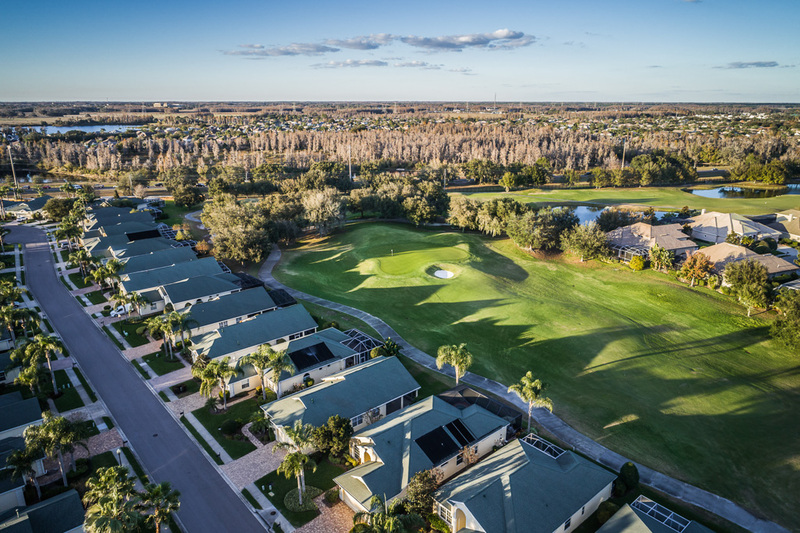 With views of the velvet greens of Fox Hollow Country Club’s premier golf course, the Florida sun shines on this home’s frontage that overlooks Hole #12. Located behind the elegant gates of the St. George community, this impeccable villa is full of refined touches: a barrel vault ceiling in the foyer, French doors to the study, trey ceilings, oversized and arched door frames, a split bedroom floor plan. What’s even MORE unique, it offers the RARE third bedroom that can be used as a second home office or den. The expansive family room integrates all the elements. Open and airy, with sliders to the oversized, screened lanai, the family room gives entrée to the formal dining area, and is adjacent to the picture perfect eat-in kitchen. Faux fronts on both the dishwasher and the refrigerator complement the cabinetry’s rich hues, giving a seamless, built-in look; all accented by a striking backsplash. In addition to high hats and peekaboo casements, a trio of picture windows filter natural light into the breakfast nook and across the breakfast bar. The master bedroom suite is a world unto itself with sliders to the lanai and a walk-in closet that feels more like a room. This well-appointed suite features a luxurious sunken tub, dual sinks, and a private shower room with commode. An impeccable home boasting: 2 full baths, a 2-car garage, inside utility room, natural gas for heat/hot water heater, reclaimed water for irrigation. Monthly HOA fees cover grounds maintenance and exterior painting. This is Trinity. https://trinityeastlakerealestate.com/wp-content/uploads/2018/03/LC-WebLogo-340x156-300x138.png 0 0 loricrawford https://trinityeastlakerealestate.com/wp-content/uploads/2018/03/LC-WebLogo-340x156-300x138.png loricrawford2017-01-13 17:09:582017-01-13 17:09:58Golf Course Views!